Reliable school management software is rapidly empowering the institutes to perform daily operations seamlessly. In today’s era, if someone is trying to consider technology and growth separately, this is not possible. If you’re lacking to some point in development, be sure others will not wait for but. In the domain of education, you need to be clearer because this is not only about your business but also about the future of kids. Technology is making progress by leap and bound. In the last few years technology in the form of online school management system software is embraced by institutes. Technological changes have left the conservatives behind. How are the Institutes Embracing School Management Technology? There is a huge part of institutes including schools, colleges and universities are earning benefits from school management software. Successful implementation of technology is not an easy thing but completely reshape entire operational procedures. Before implementation, you need to complete a lot of work and plan strategies for smooth flow. Previously school was connecting to parents to share the daily progress of students. This connection needs to be maintained to make improvements. Online school management software has successfully integrated the communicational channel that helps the institute and parents to embrace the updated system. School can remain connected to the parents to appraise and sharing performance schedule. Furthermore, schools always maintain registers to manage a student’s attendance record. It helps in knowing whether students are regularly attending schools or not. Data needs to be maintained and managed on daily basis. Online school management system software makes it easier to perform such tasks seamlessly. This software helps in improving the performance as well as the functionality of all operation smoothly. It became easier to perform daily activities without any problem. Operational easy management and a lot of other reasons are available therefore, institutes are rapidly embracing and appreciating updated technologies. Let’s have a look at significant benefits of school management solution. The software is offering an effective communicational channel that helps the institute to contact parents and staff. Administration easily shares notices, news alerts for student and it became easier to circulate information within the circle. The online school management system software is the best tool to store all important data of the institute. An institute has a lot of that need to be managed i.e. student personal information, progress report, teacher’s data, and others. Loss of information can cause a high risk that is difficult to manage. All data is stored in centralized databases and kept secure. Quality of work is another significant advantage of a software solution. All of the features and managed with great effectiveness to improve operations. You’ll be more conveniently manage operations and the productivity automatically improves. Information is inserted with high accuracy, automatic notification sending ensures that all tasks are performed accuracy. Online student grade book is the most significant aspect of the online school system software. This feature has enabled teachers to grade form any feasible location. They don’t need to fill progress cards manually that is a time-consuming process. At the same time, students can access their module and check their grade book without any additional effort. It has efficiently enhanced the collaboration among different departments. All stakeholders need to connect for seamless communication. It smartly reduces workload and improves process efficiency. School management software solution supports in organizing different important tasks and manage a variety of aspects that includes time-table management, staff support, fees, reporting and much more. Administrator finds it easy to analyze, manage and access all of the important data. Software help in saving cost at large scale including, administration, paperwork, hardware, and another cost. It helps institute owners to minimize additional cost and improve ROI. Cloud based school management software is web as well as mobile-friendly. The centralized database makes it easier to access everywhere and anytime. It supports all stakeholders including school management, students, teachers and parents to access information easily through their smart devices. Study material, student reporting all can be accessed with a few clicks. Students need to be monitored by parents, teachers and institute management by itself. Student’s academics and extra-curricular activities need to be tracked to make improvements and institute’s reputation. 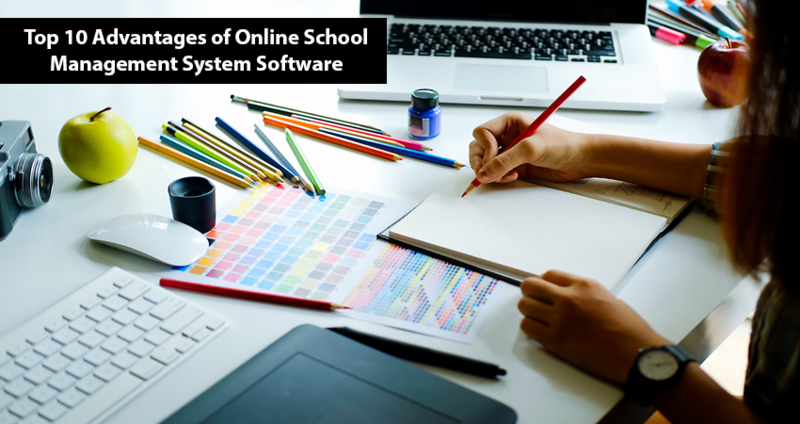 An optimized workflow of all operations needs to be optimized through online school management system software. It is a comprehensive solution to enable easy management in a smart way. No more need to manage time-table and study material manually but enable smart working. It automatically raises the staff satisfaction level efficiently.